The last weekend in August (yes I'm super behind with posts) we traveled to Austin, Texas for the wedding of one of my college roommates. Eric and I went to Austin a few years ago and had a ton of fun hanging out with Vickie and Kelly and exploring the city they love and it was great to be back for their wedding. This was Dexter's first flight and he did great. We lucked out and the plane wasn't full so we asked for a row just for us to have a little extra room and not have to bother with gate checking the car seat. I was able to nurse him on take-off and Eric wore him in the ergo and he slept most of the flight. Upon arrival we didn't need to rent a car since we knew everything was either within walking distance or there would be transportation provided. We took a bus from the airport to downtown that had a stop just a couple blocks from the hotel. The Austin Hilton was very nice and so accommodating... they upgraded us to a suite for free! Maybe they saw we were tired new parents and took pity on us! They had a pack n play delivered to the room and luckily just recently we had transitioned from the rock n play to the crib for sleep... that was a tough transition! We were starving so we walked a couple blocks to this gourmet grocery store type place and got lunch and some snacks for our room. Later that afternoon Vickie drove all the bridesmaids (and Eric and Dexter... they pretty much went everywhere I did since I needed to feed him every few hours) to the rehearsal at the Barr Mansion. And we received fun bridesmaid bags filled with goodies. The ceremony would be outside so Dexter got his first real experience with the Texas heat and he was not a fan so I missed most of the instructions while feeding him inside but luckily Eric listened to them for me and took over baby duty as soon as I was done. That night we ate delicious tex mex at the rehearsal dinner at the Iron Cactus, in walking distance of the hotel. Poor Dexter did not want to sleep with all that fun going on so Eric had to take him back to the hotel after he ate. 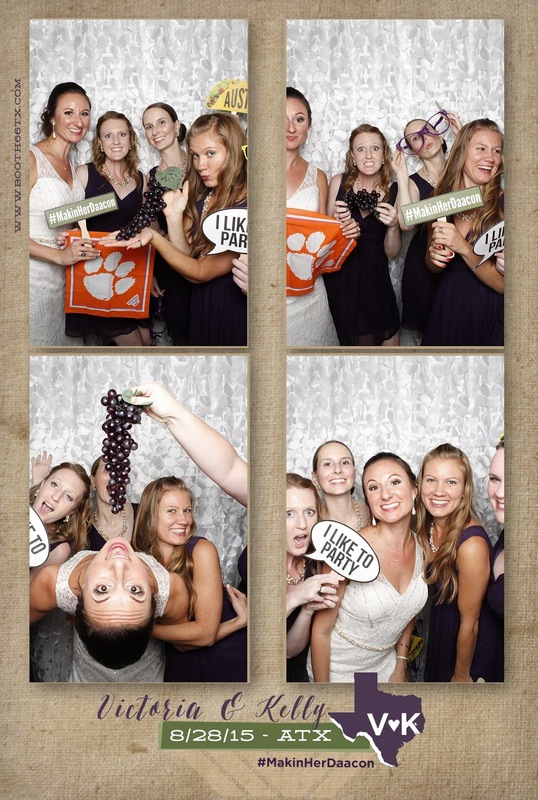 It was nice catching up with my Clemson roomies and the families/close friends of the bride and groom. Saturday morning we hung around until the other bridesmaids and bride were up and we practiced the dance (more on that later), went to get lunch at the Easy Tiger in our matching bridesmaid attire. Dexter loved having play time with Brooke and Celeste. That afternoon we all got ready and headed to the Barr Mansion. Bridal party and mother of the bride and mother of the groom. The reception was inside in a building close to the mansion and the rustic decor on wooden tables looked lovely. And the lights outside on the pathway were so pretty. Unfortunately Dexter could not stay asleep with the loud band inside the reception so Eric spent most of the reception outside with him so that I could do bridesmaid things and whatnot. He is a super dad! 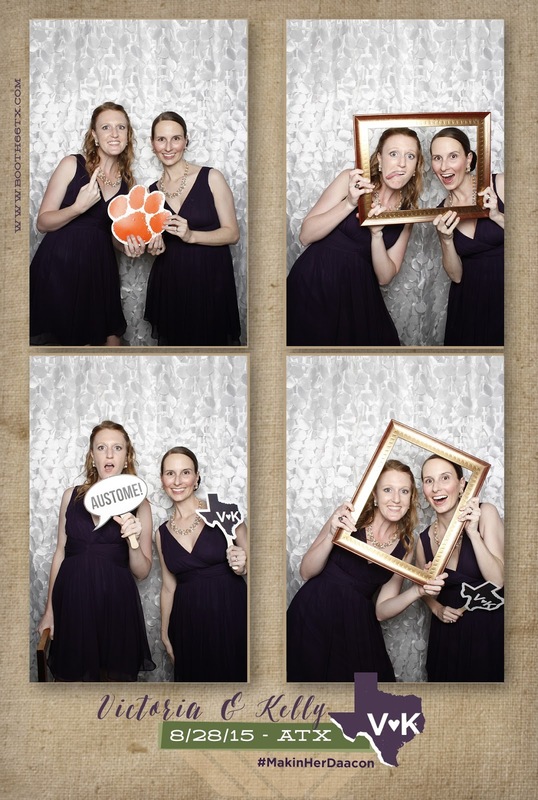 There was also a photo booth which is always lots of fun! You didn't see a preview of what the photo would look like as the timer was counting down like most booths so I think that made for some interesting pictures... there are a few I saw from Vic's family that were pretty hilarious. I liked that you had the option to email the photos to yourself to have a digital copy. Who knew Clemson would be #1 in the country... Brooke predicted it! The next morning we left for the airport using the bus again and had a good flight home. We had to gate check our car seat this time but Dexter did pretty much the same as the flight there and slept a good bit other than when being fed. I definitely think flying with a newborn or young infant was easier than I thought. It would be more difficult to fly with him now that he likes to move around a lot and isn't sleeping as much during the day. All in all a great weekend seeing our friends tie the knot! We wish them many years of happiness! Every year we try to get together with the Miller family. Tyler is a close childhood friend of Eric and his brother. It is a little harder now that there are 4 kiddos in the mix but we all decided to meet up this at the end of July in Blacksburg. It was around the halfway point for everyone and I was excited because I love seeing college towns and had never been to Blacksburg before. We rented a cabin on VRBO for us all to stay in that was probably a 10 minute drive from the VT campus. This was Dexter's first road trip and he did great! He slept the whole way there. Of course he wasn't quite 3 months old yet so sleeping most times he was in the car was his jam back then. We arrived on a Thursday late morning and all hung around the cabin. 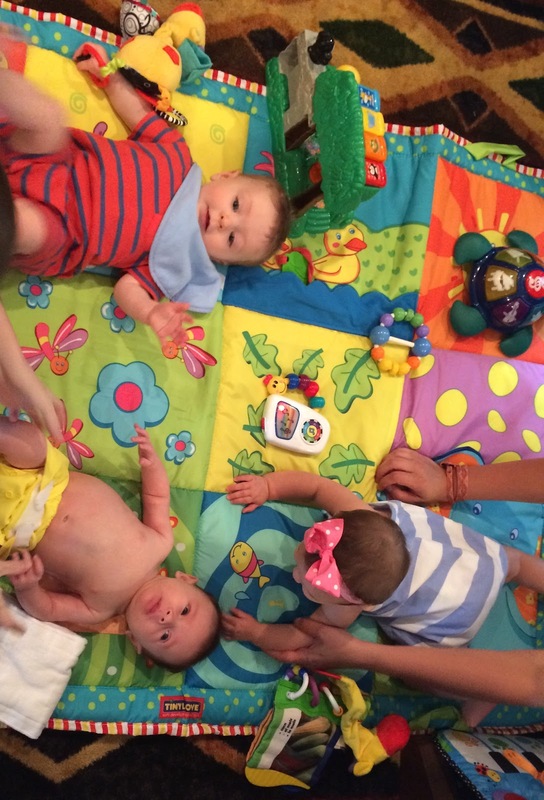 We sent the guys for groceries and let the babies play some. It is so nice to rent a place with a kitchen so you can make your own meals.. this worked out perfectly with everyone being on different feeding and napping schedules and whatnot. Plus it was more relaxing to not try to go out to dinner. Friday we drove into the VA Tech campus and after a quick stop at the visitor center for a parking pass, we went to the duck pond. It was a nice park area with ducks and a gazebo. We had lunch at Souvlaki's at the suggestion of my friend Lauren who went to VT. It was delicious and casual so they didn't seem to mind that we had 3 infants and a 2 year old in tow. We walked around a little bit after lunch. And we just hung out at the cabin and played games and took photos the rest of the day. The next morning everyone headed for home after a photo of the guys and the kids. We stopped by a blueberry farm nearby hoping to get some fresh blueberries but it was only a you-pick place and they didn't have any for sale already picked. We knew with a newborn that we definitely didn't have time for that especially in the heat so we just headed for home. The trip home took forever with a few accidents on the interstate and needing to stop to feed Dexter. FYI there are no good places to grab lunch after leaving the Blacksburg area until you get to Statesville. We held out for Chick-fil-a in Statesville but man we were starving by then! Dexter did pretty well and slept most of the way home. We had a great weekend in Blacksburg! It was a cool downtown and next time it would be neat to explore the downtown and campus a little more.